Pluto is the God that was said to have defeated the Titans in mythology and claimed possession of the underworld. In Astrology readings of birth charts the significance of this celestial body concentrates on both renewal and elimination. It concerns the rebirth of things but also the ending and dying of things too. For astrological analysis Pluto's influence will center around circumstance and show a personalities strength of reaction to sudden change. This is the smallest planetary object in our Solar System yet it's power and control have a sturdy influence on human personalities. It controls transformations and is thought to be associated with the replacement of one thing with another. Pluto is a slow moving mini planet and takes 248 years to circulate through every zodiac sign. It cannot be seen with the naked eye from Earth and was not discovered until 1930. It is constructed from mainly rock and ice and was known as a planet until 2006. At this time the discovery of other similar sized forms made astronomers realize they need the new catergory and called them dwarf planets. Pluto was designated this title in relation to its small size and low mass and volume. For horoscope purposes Pluto's astronomy label is not relevant but its mythical past and the God it is believed to represent are important. It is believed to be influential in the formation of a personalities ability to accept change and adapt accordingly. Myths concerning Pluto are scarce and are mostly representations of his adventures and conditions in the underworld where he ruled. One tale tells of the Goddess Venus as she encouraged her companion Cupid to aim his arrow for Pluto's heart. Pluto was riding through battle at the time but he immediately sought the first maiden he could find. He then quickly carried the lady named Persephone away to be his bride in the underworld. This story reinforces and reminds us of Pluto's connection with reactions to circumstantial events. Quick thinking and adaptation skills are enhanced when there is a strong presence of Pluto in a birth chart. Other mythical tales involving Pluto are usually based about his command of the underworld kingdom. Centuries ago when a person died their dead soul was assumed to be accompanied up the River Styx to Pluto's domain. They were escorted into the hands of the boatman Charon to be rowed up the river. Interestingly the recently discovered planet Pluto has a Moon that has been named after the deliverer of souls Charon. This legendary link with death is all part of Pluto's productive rebirth and transformation influences. He was regarded by many ancient people as the God of Death due to his legendary reign of the underworld. For Astrology purposes Pluto signifies the unconscious mind and transitional regeneration. Pluto in a person's horoscope layout tends to form where it will reveal the will to resist change and transform and grow with it. Although this tiny planet is linked to death it's influences and indicators are more about how people deal with change of any kind. In date and time of birth studies Pluto can indicate someone's strengths and weaknesses in this particular part of their personality. This can be useful in determining the way they are likely to react in certain situations. This often plays a major part in a person's overall character foundations and decides how they will probably act in different sets of circumstances. This knowledge can give clues and insights into an individual's way of thinking in respect of friendships, personal relationships or adapting to parenthood. Pluto has two symbols that are used in astrological work, a modification of Neptune's symbol and an initialed monogram. The slight adaptation of Neptune's trident icon is easily recognized and contains a circle as well as the crescent and cross shapes. The circle that sits on top of his trident is meant to represent mind overtaking matter to reach for divine spirit. The second symbol consists of the initials PL and these stand for Percival Lowell who was an astronomer who contributed a lot of work towards discovering Pluto. It was not discovered until after his death but out of respect for his excellent work this monogram was introduced as an alternative Pluto representation. This dwarf sized planet is ruled by the Western Astrology sign of Scorpio depicted by the Scorpion. This Sun sign is renowned for being one of the sexiest in the zodiac so its governing of Pluto is quite appropriate. Among Pluto's influential gifts, personalities are also imagined to acquire their sexual appetites and charismatic qualities from him. Pluto is additionally the authority on the occult and spiritual sides of personalities. The most valuable thing to remember about Pluto's presence is it's long term effects. Unlike Mars whose changes are short lived this celestial influence brings adjustments that are much longer lasting. 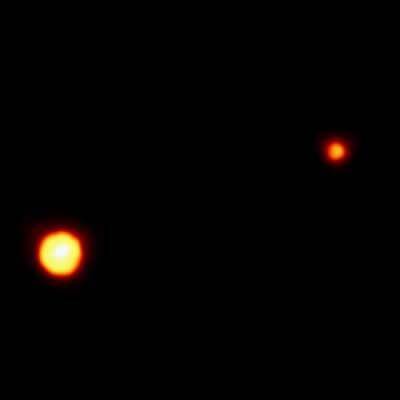 This is the clearest view yet of the distant planet Pluto and its moon, Charon, as revealed by NASA's Hubble Space Telescope. The image was taken by the European Space Agency's Faint Object Camera on February 21, 1994 when the planet was 4.4 billion km (2.6 billion mi) from Earth. Hubble's corrected optics show the two objects as clearly separate and sharp disks. This has allowed astronomers to measure (to within about 1 percent) Pluto's diameter of 2320 km (1440 mi) and Charon's diameter of 1270 km (790 mi). The Hubble observations show that Charon is bluer than Pluto. This means that both worlds have different surface composition and structure. A bright highlight on Pluto suggests it has a smoothly reflecting surface layer. ADES Also known as HAIDES Greek God of the Underworld and son of CRONUS and RHEA. When the family fortune was divvied up, he got the Underworld share while his brothers ZEUS and POSEIDON were given the Earth and Sea. There's nothing wrong with nepotism as long as you keep it in the family. They even named the place after him. Unlike many Underworld Gods, HADES is quite affable provided you treat him with respect. And although a dingy and dull place, Hades itself seems to be a very popular joint - Greek heroes are always nipping down there to rescue their mates or consult the dead. But HADES doesn't really approve of these shady goings-on. The Land of the Dead is supposed to be for the dead, alright? Even if you get past CHARON and STYX, there's a whole team of demonic officials to fend off enquiries, including THANATOS, CHARON and HYPNOS. Watch out for their bureaucratic dead tape. And don't eat any pomegranates or you'll be trapped there like his wife PERSEPHONE. HADES, known to the Romans as PLUTO, has an enormous guard dog named CERBERUS keeping watch on the entrance to the Underworld. The sign on Hell's Gate does not read 'Beware of the Dog'. It reads: 'Beware of the Three-Headed Serpent-Maned Monster Hound with Slavering Jaws and Deadly Halitosis'. Very few people have ever tried to reason with it. Some reading in a new field reawakens your mind and gives rise to fresh ideas. Practical approaches in your work routines will help you to steer clear of failures and upsets. The disposition of your associates may call for special handling today. Lending money to old acquaintances will be an unsound financial investment. Paying practical attention to your duties and responsibilities averts the more confusing aspects of the morning. Humor, wit, and the ability to entertain while getting your work done are highlighted today. Youngsters can make unusual demands on your patience today. Big gains are possible under the prevailing currents. Major adverse aspects during the forenoon caution against taking anything for granted or speaking sharply to a superior or a loved one. Lunar aspects support partnership motivation, your reaching for higher status and prestige and appreciation. If you want a brilliant career, get a more realistic perspective and take the small, practical steps that will allow you to reach your goal. You have the stamina to serve you in your work.